Readers will experience Nina LaCour's beautifully written piece about two Bay Area girls meeting via a cranky customer service Tweet, Sara Shepard's glossy tale about a magazine intern and a young rock star, Nicola Yoon's imaginative take on break-ups and make-ups, Katie Cotugno's story of two teens hiding out from the police at a house party, and Huntley Fitzpatrick's charming love story that begins over iced teas at a diner. 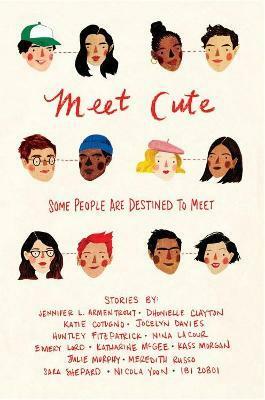 There's futuristic flirting from Kass Morgan and Katharine McGee, a riveting transgender heroine from Meredith Russo, a subway missed connection moment from Jocelyn Davies, and a girl determined to get out of her small town from Ibi Zoboi. Jennifer Armentrout writes a sweet story about finding love from a missing library book, Emery Lord has a heartwarming and funny tale of two girls stuck in an airport, Dhonielle Clayton takes a thoughtful, speculate approach to pre-destined love, and Julie Murphy dreams up a fun twist on reality dating show contestants. This incredibly talented group of authors brings us a collection of stories that are at turns romantic and witty, epic and everyday, heartbreaking and real.